When Jim and Frank Oz made the third Muppet feature film, The Muppets Take Manhattan, the musical fantasy sequence featuring the characters as babies wasn’t central to the story. 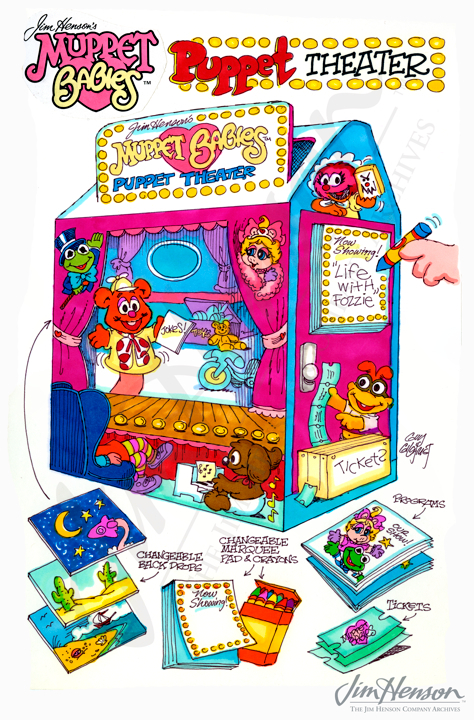 The Muppet Babies were, however, irresistible and they were immediate hits as an animated series, licensed products, storybooks, and in a music video. 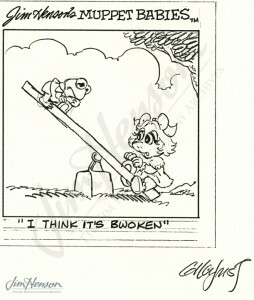 Guy Gilchrist who, with his brother Brad, had created The Muppets daily syndicated comic strip, began drawing the Muppet Babies for various Henson projects including books and licensed products. 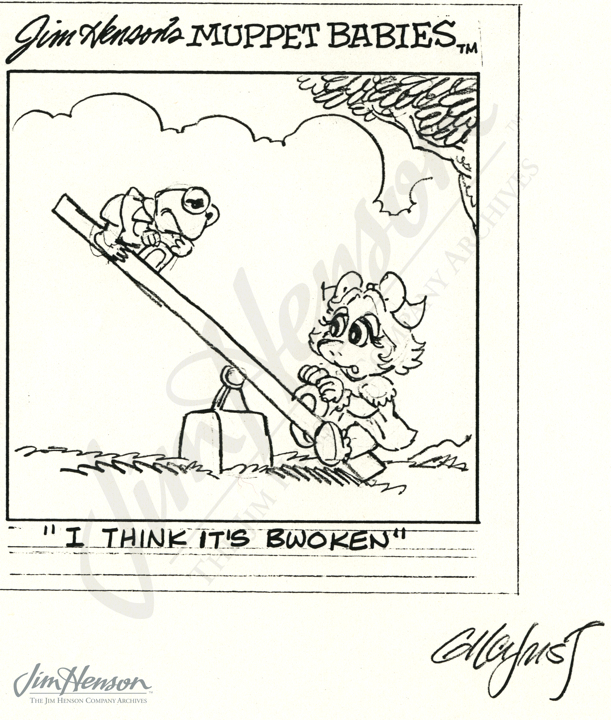 Guy had the idea for a daily, single panel comic for newspapers featuring the Muppet Babies and submitted about twenty samples to Jim along with one multi-panel strip. While the Babies never got their own daily comic, they did appear in numerous comic books from Marvel featuring the artwork of various illustrators. The Muppets Take Manhattan was a joy to promote – read about the various appearances and spin-offs related to the film. 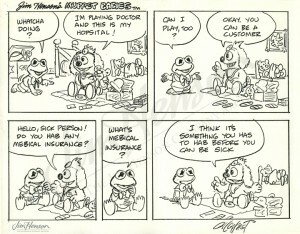 Guy Gilchrist’s Muppet Babies comic sample, 1980s. 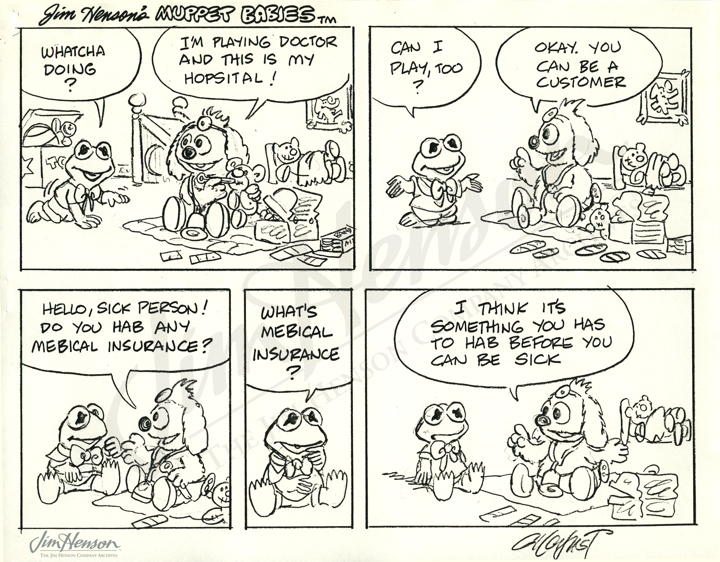 Guy Gilchrist’s Muppet Babies comic strip sample, 1980s. Guy Gilchrist designed this Muppet Babies toy puppet theater which was never produced. This entry was posted in 08-August '83, 1983, Muppet Babies, Muppets Take Manhattan and tagged Brad Gilchrist, Frank Oz, Guy Gilchrist, Muppet Babies, Muppets, The Muppets Take Manhatten. Bookmark the permalink.